Nh Students Society is a sub organization established under the RNH Welfare Society that provides services which enable outstanding student experiences. The Society organizes events and opportunities for Trainees to become acquainted with other employees of the Group. The objective of the Society is making a platform for trainees in developing their organizing skills, team work and interacting with each other well. All Trainees are required to be members of society during their training period. The Society is fully administrated by the Trainees in consultation with the RNH Welfare Society. To be a union to develop values & Professional confidence of students by encouraging their creativity & good behavior. To build responsible leaders within the organization to promote the value that represent good character in all trainees. This program provides a supportive and positive learning experience and would convey you an occasion to serve in many capacities. By participating in all functions, you will receive a pleasing experience in developing communication and leadership skills, resulting in greater self-confidence and personal growth. 1. On 1 March 2016, ABC factored (sold) LKR 2 million of trade receivables to XYZ. ABC received an immediate payment of LKR 1Â·8 million and credited this amount to receivables and charged LKR 200,000 to administrative expenses. ABC will receive further amounts from XYZ depending on how quickly XYZ collects the receivables. XYZ will charge a monthly administration fee of LKR10,000 and 2% per month on its outstanding balance with ABC. Any receivables not collected after four months would be sold back to ABC; however, ABC expects all customers to settle in full within this period. None of the receivables were due or had been collected by 31 March 2016. 2. On 1 April 2014, ABC sold a property which had a carrying amount of LKR 3Â·5 million to a property company for LKR 5 million and recorded a profit of LKR1Â·5 million on the disposal. Part of the terms of the sale are that ABC will rent the property for a period of five years at an annual rental of LKR 400,000. At the end of this period, the property company will sell the property through a real estate company/property agent at its fair value which is expected to be approximately LKR 6Â·5 million. ABC will be given the opportunity to repurchase the property (at its fair value) before it is put on the open market. All of the above amounts are deemed to be at commercial values. You are required to explain and quantify where appropriate, how ABC should account for the above two issues in its financial statements for the year ended 31 March 2016. 35% of a circle is 126Âº. Th erefore, the angle for M will be 90Âº. L-M is 36. 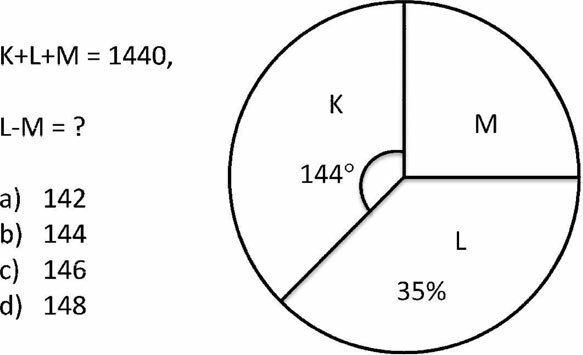 Since K+L+M=1440, which is 4 times more than 360, L-M will be 36Âº4=144. 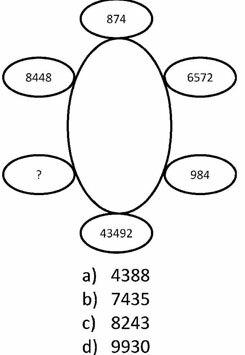 The pattern in the question goes like this: the shaded area has the largest number of sides. The first row has two rectangles and a triangle. The largest number of sides is rectangle. Hence the shaded area for the first row has rectangle. The second row has a pentagon as the largest number of sides. So the shaded area for the second row has a pentagon. The third row has an octagon shape as the largest number of sides. 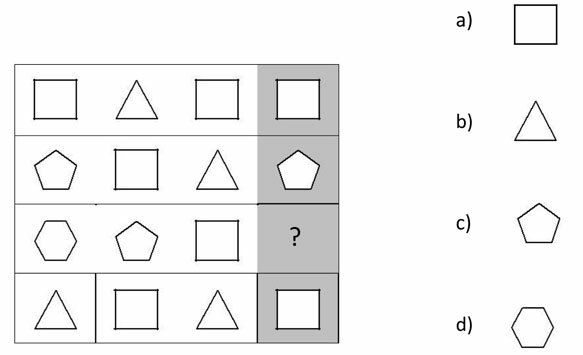 So, the shaded area for the third row must be an hexagon. 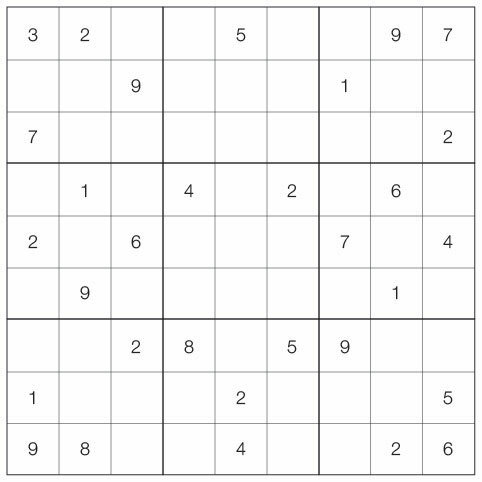 The fourth row has a rectangle as the largest number of sides. So, the shaded are for the fourth row is rectangle. The pattern goes like this: Pick the last letter in the shaded row and the first letter in shaded column and com e up with a two letter expression. 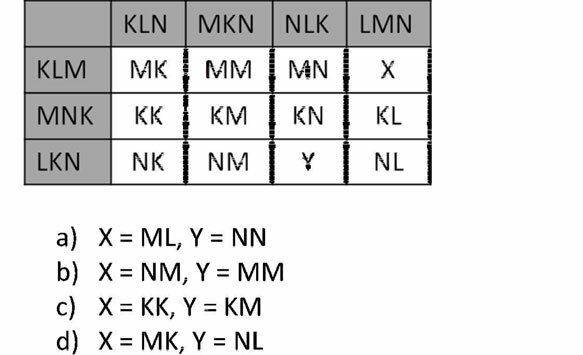 For X, we have to look at the last letter in the 1st row (M) and the first letter in the 4th column (L). So, the result is ML. For Y, we have to look at the last letter in the 3rd row (N) and the first let ter in the 3rd column (N). So, the resul t is NN. The pattern goes like this: add the digits and follow an increasing patter n in clockwise. So the digits of the last n umber must add up to 23, which is 4388: 4+3+8 +8=23. The word â€œBeeâ€ indicates that the last two digits in a number must be th e same. The only possible number is 6 55. This shows that letter â€œBâ€ corresponds with number â€œ6â€ and letter â€œEâ€ correspondds to number â€œ5â€. Since â€œTIEâ€ ends with E whic h is 5, there are two alternatives: 975 and 875. There are two numbers whose first digit starts with 8 and one number whose first digit starts with 9 in Group I. This indicates that number â€œ8â€ corresponds with letter â€œTâ€ and number â€œ9â€ corresponds with letter â€œPâ€ in Group II. Therefore, the result for â€œTIEâ€ is â€œ875â€. NH Student Society has decided to direct focus towards strengthening and enhancing our country’s education through minimizing failures and problems being faced by the rural education system. For accomplishing this task, the society has selected several local schools which are lacking with essential infrastructure facilities and facing for bulk of difficulties in carrying out their day to day activities. With the project, the society intend to eliminate the discrimination exist between leading schools in urban areas and other schools in rural areas by providing a support, focusing the areas of resources, advancement of knowledge, skills and opportunities. By motivating these students, we expect them to grow as talented personalities and thereby contribute to the development of economy of Sri Lanka.